With Christmas fast approaching, let’s talk about how to WOW your family and friends with a festive grazing table, because hey, life is too short to be stuck behind a stove and we all know you don’t win friends with just cheese and crackers! But a pimped out grazing table loaded with delicious market produce is sure to satisfy those festive bellies and give you more time to...well, pour yourself a glass of wine, go on you deserve it! It’s your Christmas too! Now to be honest I haven’t put together a ‘Christmas’ grazing table before, however I’ve recently put together a grazing table for my son’s Paper Plane themed 2nd Birthday. No matter what the event, the core principles remain the same. First up let’s talk about the foundation steps to any good grazing table and then we can get to how we can add some Christmas cheer. Now let’s start with some ah-mazing ingredients – this is not the time to be cheap, no one wants a table full of crackers! But yes do get some of those (in contrasting shapes, long, square & round), cheeses of course (soft, hard, blue – mix it up), dips (pick a few different colours), antipasto & cold meats (salami, prosciutto, sundried tomatoes, bell peppers, olives), some petite cakes (add some pretty to your table, and remember get some contrasting colours and shapes - check out From the Wild for some inspo), dried fruits (apricots, apple), see what fruits are in season (these may not necessarily be eaten but they sure give your table some good eye candy - grapefruit, kiwifruit, pomegranate, grapes, blood orange, figs), along with some berries (strawberries, blueberries, raspberries) and some nuts & seeds (almonds, walnuts, pumpkin seeds). You want to make your table 3 dimensional and create a sense of drama. To do this, use crates, platforms, plinths, boxes … you can really use and repurpose anything, this is where you can get creative. From here it’s time to add depth with layers, you can add a cake stand, cupcake stand, chopping-boards, platters, bowls, brown paper bags, ramekins, mason jars etc. These will essentially act as your anchors on the table. I sort of like to think of it as ‘colouring by numbers’, you know those colouring books where each section is numbered and equals a colour? Well the same principle applies with a grazing table… the chopping boards = cheese, the larger ramekins = dip, the smaller ramekins = olives and so on as you slowly build up your table in this process. For example, let’s take a closer look at putting one vignette together: To the chopping board add an array of petite cakes. To your ramekins, add a dip to one, sundried tomatoes to another, and mini gherkins to another (whatever you use be sure to mix up your colour pallette). Around these add your larger fruits – this will add that Insta-worthy glam and make your table ‘pop’ (cut these into halves - blood orange, kiwi fruit etc.). Add your berries (e.g. strawberries) then another variety of contrasting colour (e.g. blueberries) making borders around your anchors. From here add your ‘fillers’ your bigger nuts (e.g. almonds) followed by your smaller seeds (e.g. pumpkin seeds) these are used to ‘fill in the gaps’. Throughout this whole process always keeping in mind to use contrasting shapes, textures and colours. Lastly add your foliage (choose something that will be hardy and not wither and die). These will be used as another ‘filler’ to fill in any larger gaps that have been left bare. When you multiply these vignettes around the table you’ll have yourself one pimped out grazing table…voila! I strongly suggest you take a step back and take in your masterpiece! Now hands off and control yourself…don’t demolish the table before everyone arrives! Now that we have the foundation to any great grazing table down pat, let’s get to the fun stuff and add some festive cheer. The idea of hanging foliage as a backdrop (as I have created at our birthday party) could easily be used to set the Christmas scene. 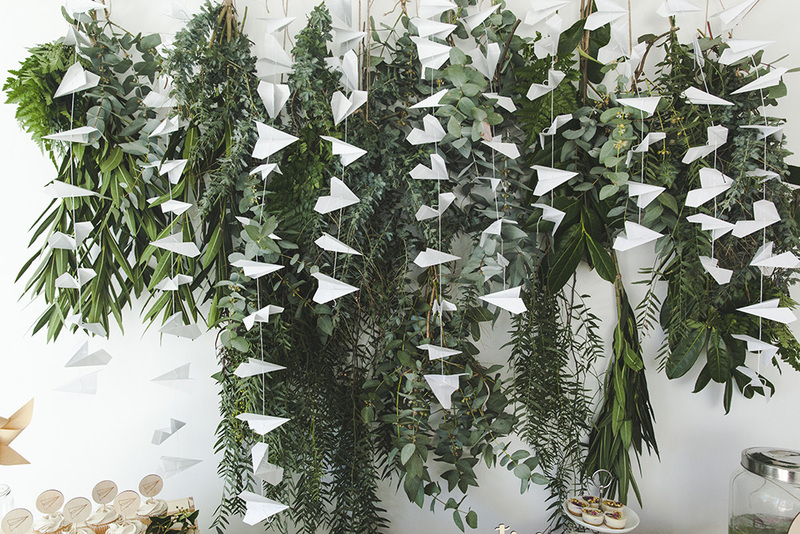 This hanging foliage is easily recreated by suspending a horizontal pole and adding bunches of different foliage - hanging at different heights (again with the foliage remember to choose something that won’t die within the first hour of your guests arriving!). Next think about your colour scheme, red, green, white, gold or silver perhaps? Here are some ideas I’ve put together where you could replace our hanging paper planes used at our birthday party for something a little more in line with the festive season. Using the same concept of the vertical paper plane drops, make up your own using Christmas baubles, pine cones or Christmas Candy? You could even cut out paper snowflakes if you feel like getting crafty! Decorate the greenery as you would a Christmas Tree with all your usual Christmas decorations hanging off the ends.